This Sunday at long last my first real server “Spike” died. Spike wasn’t really my server, but it was the first server that wasn’t just for my entertainment and I carried final responsibility for. Purchased in February 2001 it entered service as a shared hosting server for a not-for-profit in March 2001. In the 8 years and 1 month it ran the only real problem it had was a worn down CPU fan causing an overheated CPU, until Sunday morning at long last the primary harddisk died and it was retired from service. With its demise I am truly saying goodbye to an era (or perhaps to a relic): Spike ran trusty old Windows NT4 SP6a with ColdFusion Enterprise 4.5.2. With it gone, the youngest production machine I have access to is a Windows 2003 system (7 years younger then NT4) with CF 7 (6 years younger then CF 4.5). Spike itself is replaced with a machine with Windows 2003 and CF 8.0.1. And the contrast between how it worked then and now it works now is quite profound. At least in the area of security configuration, CFML is sufficiently backward compatible to just drop it on the new server. 2001, the year Spike was configured, was just before the height of the ‘hackable internet’. A few months after it was taken into production we saw the release of Code Red, followed shortly by Nimda. At that time, a large part of the servers connected to internet was vulnerable to attacks. (Nowadays vulnerabilities are more of a client problem or arguably a user problem then s server problem.) And that showed itself in the way Spike was build. It took me several weeks to come up with a stable and secure configuration, with all sorts of weird constraints. To build Spike I followed the NSA guidelines for configuring a Windows NT system, which for instance meant I wasn’t supposed to install any graphical driver, because no driver was NSA certified. And the way I ended up running ColdFusion, with Sandbox Security configured to impersonate OS accounts, has once even earned me the comment from a Macromedia engineer to be the only one in the world with that configuration in production. But the result was there: even with the onslaught of Code Red and Nimda it took 7 months before there was a Windows patch that was applicable for the hardened configuration. Contrast this with how I threw a new server online. Windows installation was a default installation, after which I had to add components instead of remove them. When installing IIS I had to add filetypes and extensions, instead of remove them. 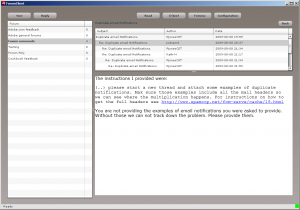 When configuring Sandbox Security for ColdFusion I could easily find anything I wanted on the subject, because there are dozens of people blogging about it. Obviously some of the ease of installing a new server is due to more experience on my side, but I think it is hard to deny that the “secure by default” mindset has made inroads. Posted by Jochem on 2009/05/06 at 22:44 under Uncategorized. Just a quick update on the two avenues I am pursuing to get the new Adobe forums to open up and share their content. Adobe is going to followup on the email headers with Jive to see what they can implement. 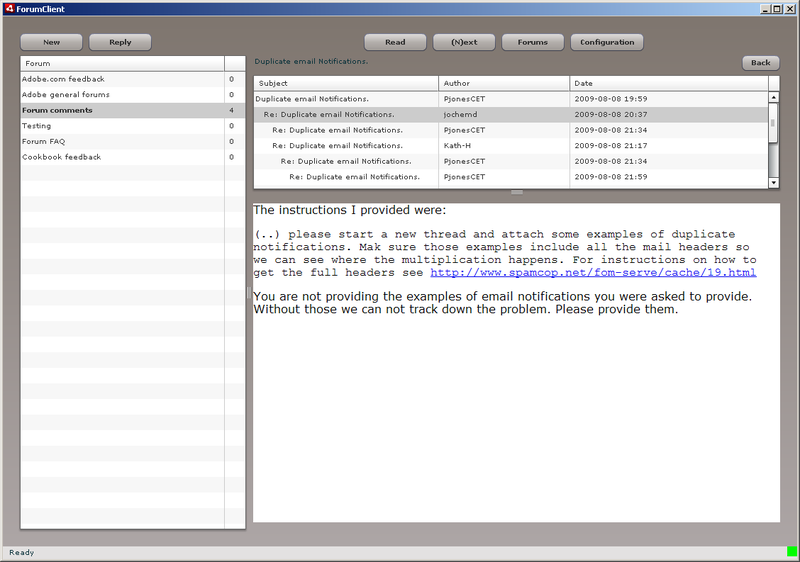 Hopefully this will result in getting the References and / or In-Reply-To headers added to the outgoing email notifications soon so email clients can thread them properly. It should be almost trivial to implement that, because judging by the definition of the ForumMessage object each forum message knows its own ID to put in the Message-ID header and also knows its ParentMessageID to put in the References header. The other avenue is getting access through the webservice APIs. I have been looking at the login sequence of the Adobe site and it looks like the master cookie to determine whether you are logged in is the AUID cookie for the .adobe.com domain. Subsites may add more cookies and eventually maintain state through their own cookies, but if you have the AUID cookie you can get in. So I have reduced the dozens of requests involved in a browser logging in to the forums (many of them image requests) to two requests a client must make. I have included the minimal wget testscript to simulate the login here. wget -S --load-cookies=adobe.txt -O forumindex.html "%FORUMURL%"
I need to tweak this a bit to do proper login validation, but it looks like just ignoring all the authentication mechanisms in the API and running these requests instead and then maintaining the collected cookies with all webservice calls will do the trick. Even though the entire login sequence will end up taking close to 15 seconds due to the response times of the Adobe sites, that is progress! Posted by Jochem on 2009/04/09 at 21:45 under Uncategorized. Every year we all go on a trip together for a few days with everybody from Prisma IT. This year the trip is to Iceland. 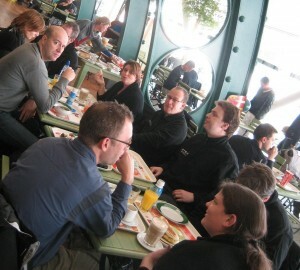 This is all of us having lunch at Schiphol airport before boarding. Posted by Jochem on 2009/02/12 at 12:35 under Uncategorized. Today Google released a first Beta of Google Chrome, a new web browser. Just installing it already showed how Google Chrome is different from other browsers. Since I am always logged on on my laptop as a normal user I right-clicked the installer and choose the “Run as” option and installed it under the Administrator accout. The result was surprising: it didn’t work. No error messages during installation, but I couldn’t get any website to open. After some searching I figured out that Google Chrome installed itself in “%USERPROFILE%\Local Settings\Google\” so you have to install it as the user that is going to use it. So after installing it as myself I could see pages and the fun starts. One of the touted differences between Chrome and current browsers is that Chrome runs each tab in a separate process and processes are independent and one process will not affect another, even when it crashes. 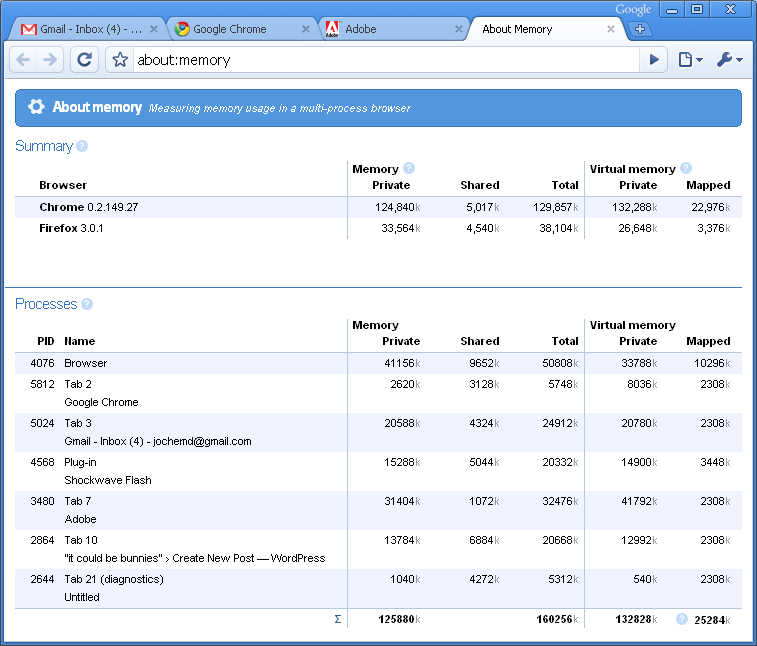 (Reputably the current IE 8 beta has the same feature, but I haven’t tried that yet.) So when you look in the Windows Task Manager you see separate processes for all tabs. 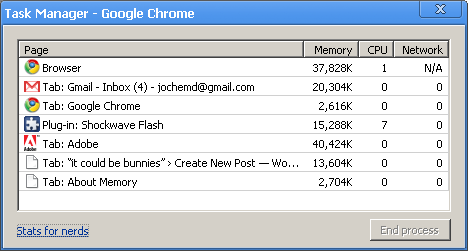 With Chrome’s own Task Manager you can see a little bit deeper since you can see which process is which tab, but the real good stuff is in the “Stats for Nerds” which shows detailed information. I have included screenshots of all three below here. The most remarkable thing other then that is how unremarkable Chrome is. It is very unobtrusive with very little chrome and lots of room for content, it feels extremely responsive and it just works. It didn’t ask if I wanted to install the Flash Player, it just worked. I don’t even know if it is embedded or if Chrome borrows the Firefox plugin or something. But since it runs in its own process the memory consumption becomes visible. So I guess pretty soon people will start to look a whole lot closer at the memory consumption of Flex applications. All in all the first impression is very good. After the installation hurdle it just works and I really like the security / process / memory model (it feels like Unix and specifically like the model of PostgreSQL). And I mean really like it. Now I know I am a bit peculiar in my security habbits / preferences (how many others will have run into the installation issues I did? ), but I really take such issues into consideration when I choose tools. And so far Google Chrome is scoring big points. Posted by Jochem on 2008/09/02 at 21:54 under Uncategorized. Posted by Jochem on 2008/03/04 at 22:35 under Uncategorized. And in case somebody is wondering “it could be bunnies” is a quote from the episode Once More With Feeling of Buffy the Vampire Slayer. Because not only is Buffy the Vampire Slayer one of the most awesome TV shows ever made, it is also a constant reminder to think out of the box. Posted by Jochem on 2008/01/24 at 18:22 under Uncategorized.